This book and accompanying audio CD is a collection of seven short and sensory nature meditations to aid relaxation. Suitable for all ages, they help us to learn how to relax, create a sense of calm, ease anxiety, and assist those struggling with sleep issues. They were written in the first instance to help my children settle to sleep at night and particularly to aid my son, who suffers from stress, anxiety and insomnia, related to his ADHD and Autism Spectrum Disorder. 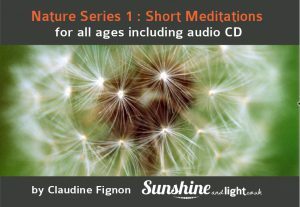 As a result, these meditations are all highly accessible for children, teens and adults alike. We also use them to promote calm for relaxation in our yoga classes for all ages. The techniques and descriptions in the meditations use all the senses to make them highly tangible, giving a point of focus in order to facilitate relaxation. The focus they give helps to switch off the mental chatter, that so often can be a barrier when trying to meditate. The book and CD can be used in different ways. The scripts in the book can be read by a parent to a child giving an added sense of safety and peace, enabling a deeper feeling of relaxation for the child or the tracks on the CD can be played while you relax. MP3 versions of the tracks are included with your purchase, simply supply your email address. Other meditations are Autumn Tree and The Rock.